Root canals are a way of getting rid of the infection in a tooth without getting rid of the actual tooth. A root canal won’t save your tooth from becoming infected—by the time you need one, it’s too late for that, but it will allow you to keep your tooth. After a good diagnosis eliminating all other possibilities for the tooth. Then numbing the tooth so that you can’t feel the tooth pain anymore. A dentist or endodontist will go into the tooth to reach the infected pulp at its core. Next, the inside of the tooth is flushed out, the root is filled with sealer and gutta percha. Then there is a permanent filling put in the tooth called a core build up. Sometimes the core build up may have a post into the root to give the tooth additional strength. Then on some front teeth and all back teeth a crown is done and cemented. This procedure ensures that no more bacteria can get inside the tooth and minimizes the chances of the tooth breaking. The way teeth become infected is through decay, cavities, or cracks from an injury, which means it’s usually an avoidable problem. If you’re brushing and flossing properly, your teeth are unlikely to reach a level of decay that allows bacteria to reach the living dental pulp inside them. However from time to time we see teeth that need a root canal that have never had a filling and have no sign of decay. This isn’t seen often but a couple times a year we see this happen. The point is it can be hard to figure out which tooth is hurting and why. That is why you call the dentists at McOmie Family Dentistry we are here to help. Constant tooth pain that won’t go away no matter what you take for it. Here at McOmie Family Dentistry both Dr. Mark McOmie and Dr. Ellen McOmie routinely do root canals. 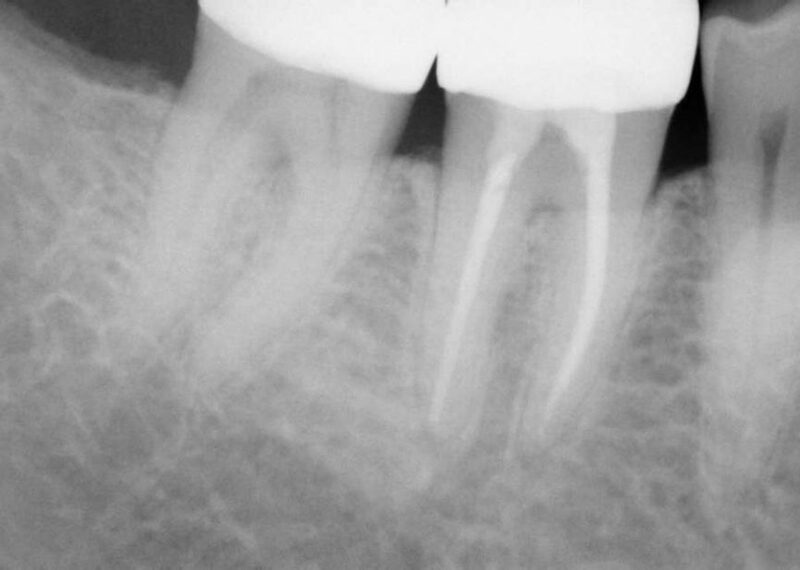 We do root canals on anterior teeth, bicuspids, and molars. We do on a normal day from 3-5 root canals at our office. Root canals are not painful during the procedure you should not feel any discomfort at all. If you do we stop and get the tooth properly numb so you don’t feel anything. There is no reason to hurt while at the dentist. Root canals can take as little as 15 minutes and up to one hour. On a posterior tooth usually we do the root canal, core build up and a crown in under one hour. That way at the next visit it is just to cement the crown, which usually takes about 15 minutes and you don’t have to get numb. We use the latest in technology to make your experience the least traumatic as possible. For example we use an instrument called an apex locator, it can help find the apex of a root which is required when doing a root canal. We know you don’t know what that means and we won’t bore you with the details. Before this instrument it was common to take 45 minutes to find the apex of the root. Now with this instrument we find the apex in less then 30 seconds. Taking 45 minutes and turning it into 30 seconds of treatment is just one of many examples of how this procedure has become much easier on the patient then it used to be. Root canals are almost always done in one visit at McOmie Family Dentistry. We have been doing it this way for nearly 20 years. We find that we have greater success with less pain to our patients when we do the entire procedure in one sitting. We have the skill to do root canals at a high quality, in a short amount of time with no pain. When we do root canals we always use what is called a rubber dam. As explained in the video above the goal off a root canal is to clean the bacteria out of the hollow space in the middle of the tooth. We don’t want the bacteria and the rinses in your mouth. The files used to clean the tooth out are very very small. A rubber dam is used for safety during a root canal. If we drop a file the rubber dam keep you from swallowing it. Often times when we have a patient with a toothache that is new to our practice and we pull out the rubber dam they ask what it is. It is nothing to worry about and fits around the tooth with minimal effort and no discomfort. All root canals are done under magnification and special lights to help us see everything we need to see. These don’t touch the patient of really get near the patient but it can look a little weird. Again as with the other things it is to help us do the highest quality of dentistry while keeping our patients comfort optimal. Remember that preventing the problem is always better than needing a solution! Healthy teeth don’t need root canals, so keep brushing twice a day and flossing daily and cut back on sugary drinks so that your teeth will stay healthy! If you do have a tooth problem remember, most problems with teeth can be fixed without a root canal or pulling the tooth. If you do need a root canal we can help turn that mountain into a mole hill. It will be easier then you think, promise! We love our patients! Thank you for choosing McOmie Family Dentistry 423-899-1112.